I hope everyone is staying warm through yet another cold spell! At Murano Phase II interim occupancy was obtained and we are working on obtaining final occupancy within the next week! We have some owners already moved in and getting cozy! The parkade is complete with painted lines, numbers and labelled storage lockers. The gym is in the progress of being set up with equipment and mirrors. Our designer did a fantastic job at choosing common area finishes. She will be working on the furniture and décor and getting it set up come April when the majority of owners have moved in. The show suite is currently a work in progress and will be complete shortly for Cathy and Nikki to show off to all potential buyers. The workers were working hard through the night. The light fixtures are hung in the suites with great care. In hopes that the owners will soon be moved in there. The flooring is installed up to three floors. While kitchens are already started and pulling ahead. The painters a painting up, up and away! They will be starting the 4th floor before Christmas Day. Onto the third floor already they go! And I hope all are excited! Now dash away dash away into the Holidays we go! Hello Everyone! I hope we are all prepared for this winter with fuzzy slippers and are stocked up on lots of hot chocolate! 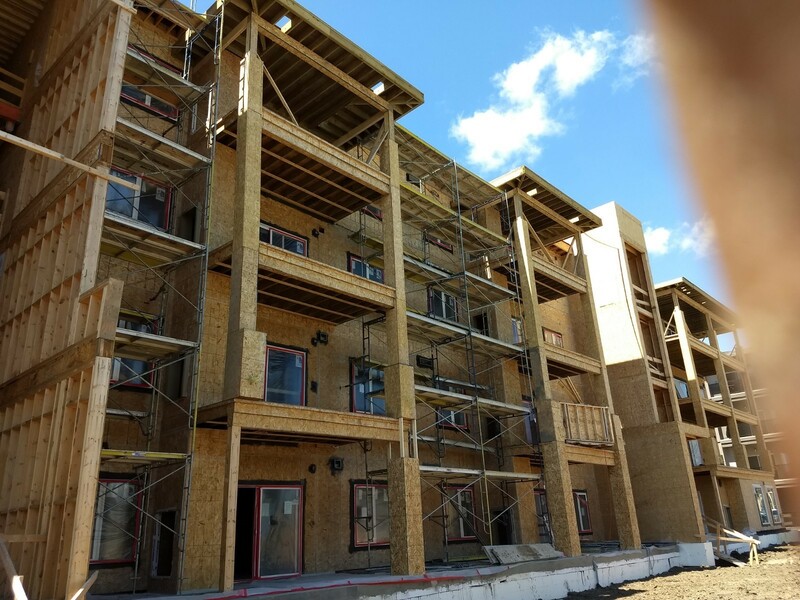 Your new homes are certainly coming along! All parking selections have been made and finalized. The flooring is almost complete on the first floor and have started on the second, with baseboards starting to go in. The final coats of paint are almost complete on the 1st floor suites. 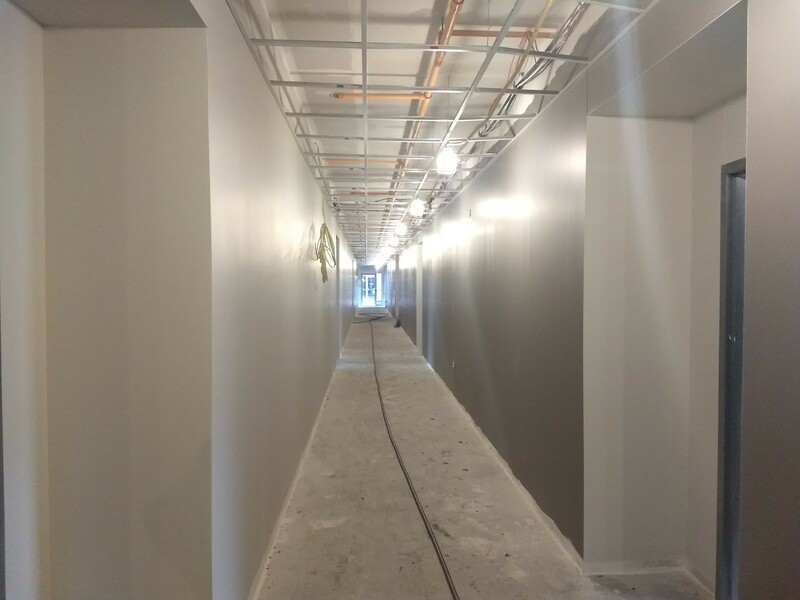 We have our electricians placing light fixtures in your suite as well in the corridors with the ceiling tiles almost complete. Our cabinets will start to be delivered mid-November. The asphalt has been poured for the outdoor parking and drive way. For those already out building snow-people, stay warm! Murano Phase II is coming along splendidly! The drywallers have been hard at work and are now on the 4th floor! The North side staircase is also being worked on by our drywallers. We have our painters now working on the third floor. In-suite doors have been installed on the 1st, 2nd and 3rd floors. Suite entry doors are starting to go in on the 1st floor. For the exterior stucco is being worked on the southside and the perimeter fencing is due to start shortly. Parking spots are currently being selected and the lockers will be assigned shortly. We look forward to getting Murano Phase II completed and getting all the residents in. At Murano Phase II we are working hard to get everything completed. 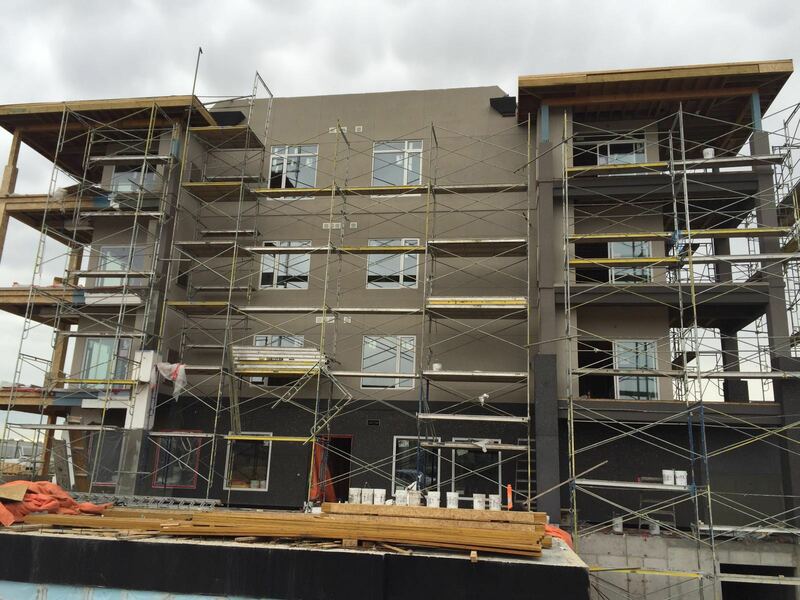 The stucco on the front of the building has almost been completed. The work on the front entrance glass is currently in progress. On the first floor the drywall has been put up and they are already priming! Drywall is currently in progress through out the building. Aya Kitchens has placed the order for all your kitchens, and the other suite selections have been sent off for processing and ordering. Don't forget to book your appointment! I hope everyone has been enjoying this nice hot weather! At 1048 Wilkes ave Murano Phase II things are coming along! We have our flooring samples in and if you have not already booked your appointment with Kylie please do so immediately! We require all flooring, backsplash, countertop, cabinet and paint selections in by August 15 2018. The shingles have been completed for the roof. The drywallers are beginning to board up the 1st floor units and hallways. We are prepped and almost ready for the stucco to be started. We look forward to meeting with everyone soon! Construction is moving along well. This warm weather has construction moving along nicely! Our shingles have arrived on site and we are in the process of putting them up. Our floors are set to be poured at the end of this week. The electrical rough ins are now being completed on the 4th floor. The plumbing and electrical are completed up to the third floor. We have our inspections for electrical and plumbing for the first, second and third floors coming up next week. The framing for all the floors is really coming together to define each suite. The parkade floor has been poured. Our cabinetry samples have arrived and some have already picked their selections for the suites. We are hoping to have our flooring samples shortly and will advise everyone once they are received. Murano Phase II is well under way! We have erected the fourth floor walls and are assembling the frame for the roof. Our electricians are working their way up to the third and fourth floor. The windows and patio doors are also being installed on the third floor. We have our cabinetry samples in from AyA Kitchens and are starting our suite finishing appointments next week. We should have our flooring samples in shortly and will be in contact with everyone once they are received. Enjoy the weather this long weekend and go Jets go! Murano Gardens Phase II is taking off before our eyes! Murano Gardens Phase II is taking off before our eyes! We are now standing walls on the third floor and are installing select windows throughout the building. We also have plumbers and electricians on site starting rough ins on the first floor. 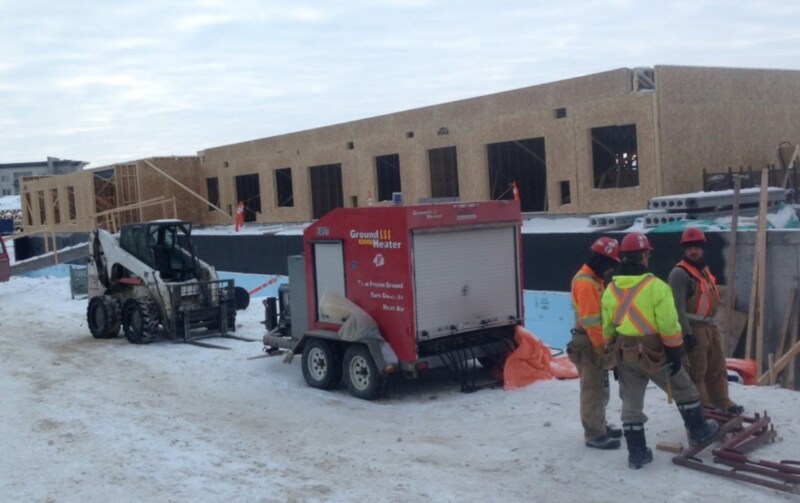 The parkade is busy defrosting in preparation to pour the slab, after which time our clients will be able to pick their underground parking stalls! We have finalized the upgrades in some of our client’s suites and are just waiting on the new cabinetry samples to arrive. We are told it should be around the end of April and will continue to keep you posted! Enjoy this beautiful sunshine and warmer temperatures! If you have driven by recently you will know that we are now above ground! The foundation is complete and we started framing the first floor at the end of February; the trusses are almost completely sheeted, and after we will begin the second floor. The parkade is quite busy as well with mechanical and electrical rough ins beginning in the space. We are in the process of finalizing some of the upgrades in our client’s suites which is very exciting! Now we are just waiting for the new cabinetry samples to arrive so that we can start making decisions on finishes; we will keep you posted! The work continues despite the cold! 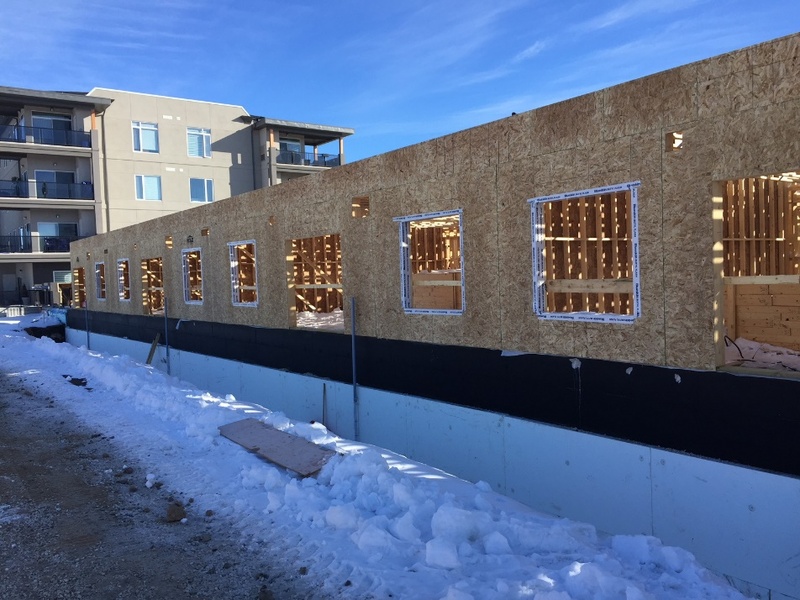 We have crews working hard through this cold snap to continue your foundation walls and steel beam installations, all in preparation for hollowcore installation and the framing that will follow. It has been a pleasure starting to meet some of our owners. 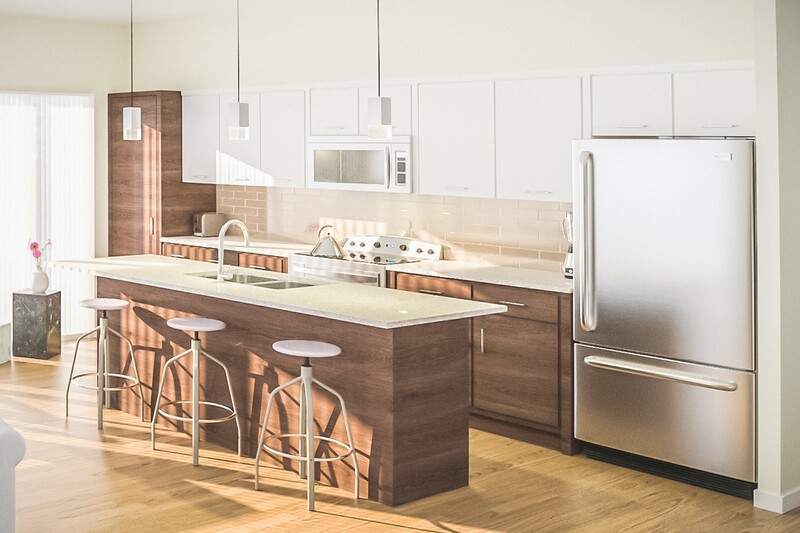 As a bit of a surprise, AyA Kitchens has announced that they are coming out with a new 2018 line of wood-grain cabinetry; we are excited to see the new options that are available! Happy New Year from all of us at Murano Gardens! The foundation is coming along well, with the final pour of the walls scheduled to be completed before the holidays! In addition, all of the site services have been trenched and completed including waste and water lines. Next week if you are in the area you will see a crane on site! 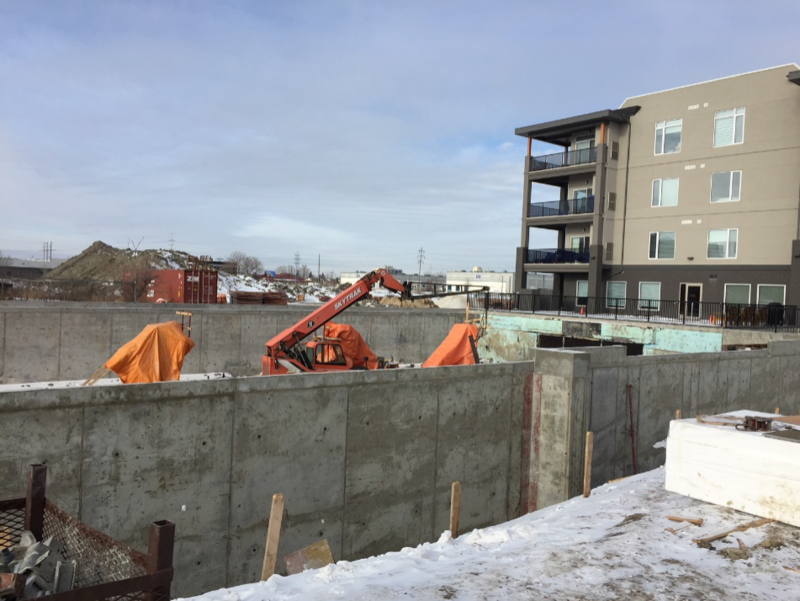 We have the foundational steel beams coming in which will start being placed, with hollowcore (concrete, precast slabs between the parkade and first floor) to come soon thereafter. We are excited to meet you in January! Wishing you a very happy holiday from all of us at Murano Gardens! We are very excited to announce that the Murano Gardens Phase II excavation is complete and the foundation is well underway! We are very excited to announce that the Murano Gardens Phase II excavation is complete and the foundation is well underway! The walls are almost completely poured for the parkade, and we are now moving onto the columns. We are also preparing to meet our clients starting in mid-January and cannot wait to start putting faces to the names and facilitating decisions being made about in-suite finishes! If you have any questions about suite availability in Murano Gardens Phase II please do not hesitate to contact our sales team for further information, or come by during Presentation Center Hours in Phase I (Tuesday and Thursday 5 – 7pm, Saturday and Sunday 1 – 4pm). We are delighted to announce that Phase 1 of Murano Gardens is now complete! We are delighted to announce that Phase 1 of Murano Gardens is now complete! Homeowners have begun to move in, and we hope that you have had an efficient and comfortable time so far in you new home. Phase 2 of the Murano Gardens project is pre-selling quickly, and is currently 50% sold. Our team is very excited and would like to thank you for your continuous support. Due to an increasing demand for suites, construction for Phase 2 will start this coming summer. This new project will consist of 43 units ranging in size from 704 to 1208 square ft, as well as many of the same features that made the first condominium an appealing choice for buyers. All suites will include 9-ft. ceilings; penthouse suites will have 10-ft. ceilings. Wide patio doors will lead to a large balcony, and the oversized tripane windows will let in natural light, controlling the warmth or coolness of each room. Like Phase 1, the upcoming Phase 2 will feature a beautiful and unique exterior. The combination of stone and terra-neo stucco adds texture and sparkle to the building, and it looks absolutely gorgeous. Not only will the building be pleasant to look at, but its suites will be very user-friendly. 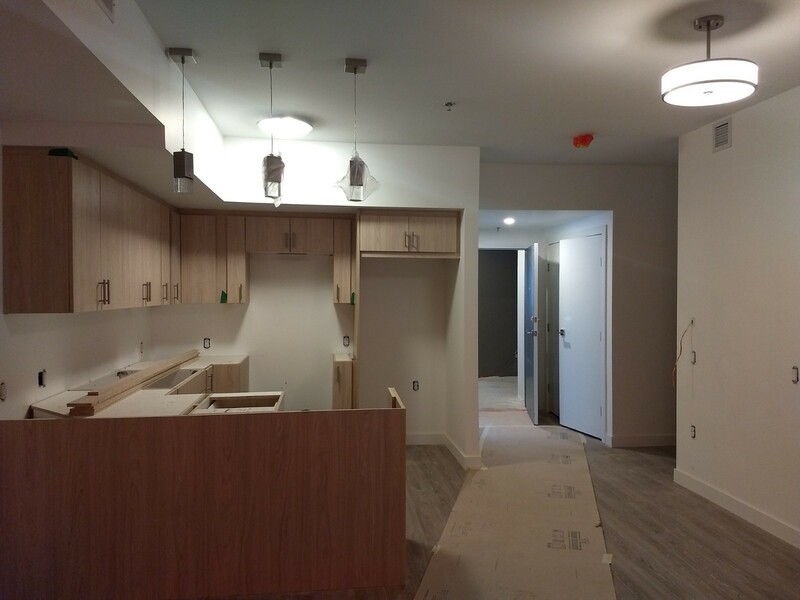 Energy-saving LED lighting, HRV systems within each unit, and walk-in showers will make the suites much more livable. We wish you all a happy and enjoyable March Break, and make sure to stay tuned for more updates on our newest building project! we would like to wish you a very merry Christmas and Best Wishes for the New Year. From all of us at Murano Gardens, we would like to wish you a very merry Christmas and Best Wishes for the New Year. 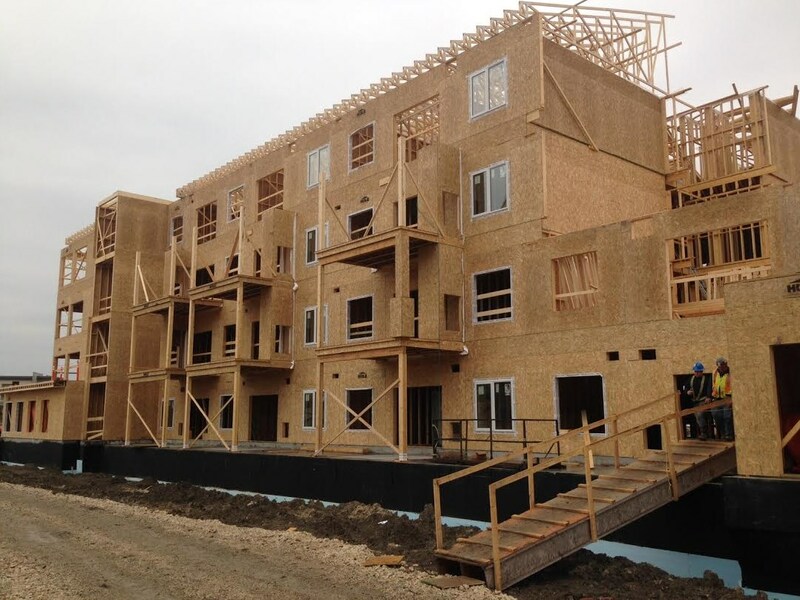 We are near the finishing touches of Winnipeg’s newest condo with possessions scheduled for January. The team was setback due to delays in getting power to site, but finally today we got full power. 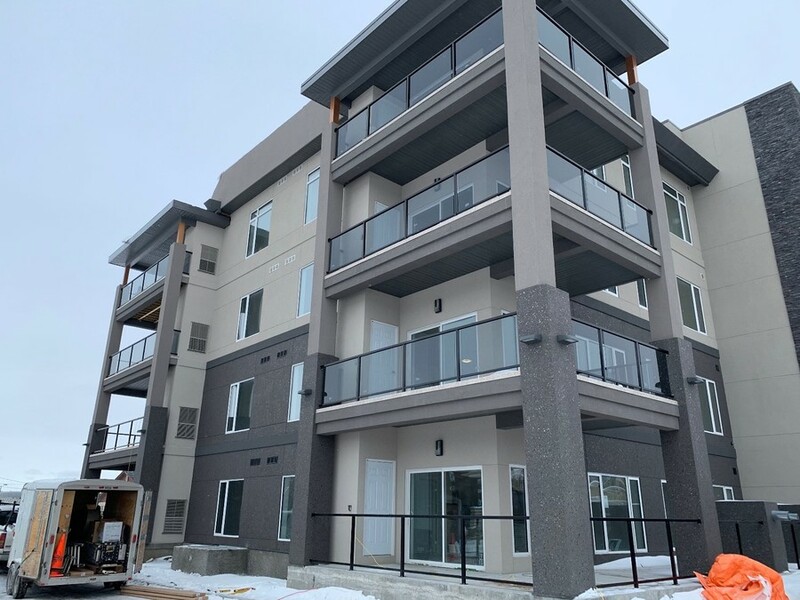 They are working hard round the clock to get occupancy on these luxurious suites as they are busy installing flooring, kitchens and quartz countertops. The stainless steel appliances are now being delivered. The parking lot is surfaced and the underground heated parkade is ready for occupants. The entire façade is now complete and the combination of stucco, TerraNeo, curtain walls, stone and metal panels is looking stunning. The views from the oversized balconies are beautiful and we are excited to welcome our owners to them homes. We want to thank you for your support throughout the year and we hope that all your wishes come true this holiday season. "To date, Murano Gardens of Linden Woods has sold 80 per cent of the suites in its Phase 1. With demand for suites high, construction for Phase 2 of the project is slated for this coming spring." 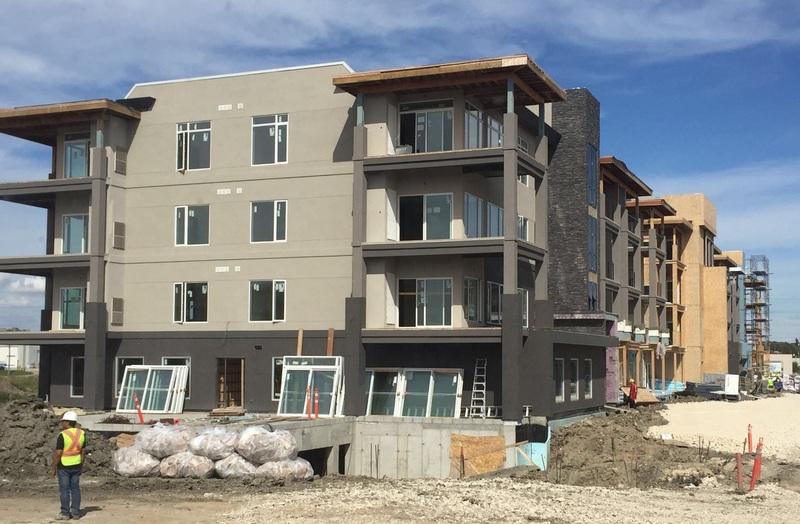 Our industrious team here at Murano Gardens have been working hard all throughout the summer, and now that the holidays are drawing to an end, we would like to enlighten you on the progress we have made over the past month. First of all, window installation throughout the building were completed during the week of August 15th, in addition to work on the north side corner decks. 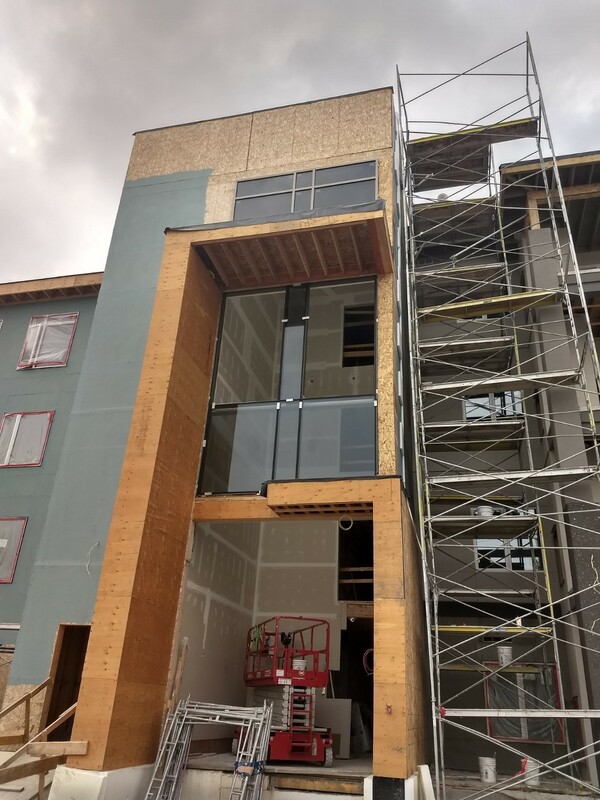 The back balcony pour was successfully finished as well, and the elevator beam was installed by Merit Iron and the elevator installation has commenced. 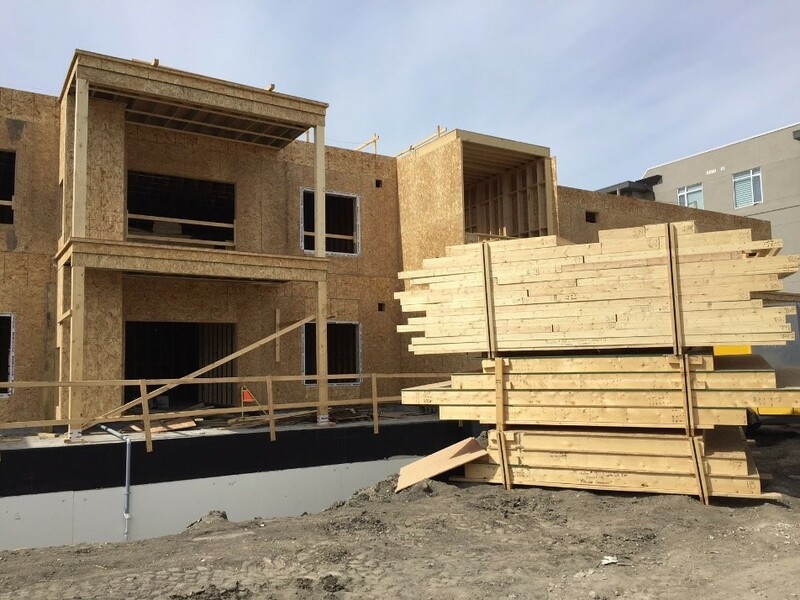 To add to the list of completed processes required for the construction of our condominium are the prepping decks which were completed on August 26th, as well as plumbing rough-in. The drywall process, which includes taping and drywall in suites, is continuing to work its way up through the building, and sprinkler installation has begun. Finally, we would like to thank our buyers who have helped us reach 80% in sales! Prospective customers have still got a variety of amazing units to choose from, and if you have any questions feel free to visit or contact us. 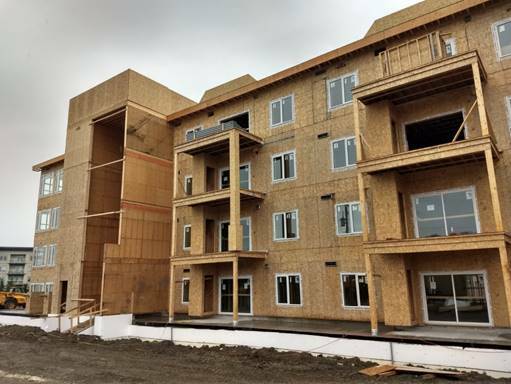 For those of you who are not a fan of the rainy summer we are experiencing in Winnipeg, our team at Murano Gardens has made good progress that may brighten up the season and bring a smile to your face. First of all, framing, which includes the installation of patio doors, windows, and rafters, is complete! After weeks of arduous work and planning, this is a great milestone, and we hope that you will be as happy as we are after moving into your new home. In addition, the final part of the roofing will begin this week, but this is not the only process making great progress. It is expected that one third of the large building be dry walled by next week. We are also pleased to announce that kitchens have been ordered for the first third of the condos and are expected to arrive during the first week of September. Quartz slabs for kitchen countertops (that are included standard) have been delivered to our fabricator as well. Finally, landscaping has begun with the construction of the retaining walls, and will continue this week. We hope you are having a fantastic summer, and if you have any questions regarding our sales, feel free to visit our sales center or contact our sales agents via the email or phone number displayed on our website. Almost two thirds of the building is fully sealed (framed, windows and roof completed). Work has started on interior insulation and drywall. Our purchasers’ have selected their customized finishes and orders are being placed for the first set of kitchens. Our team is excited as we are entering the interior finishing stages. The views from the oversized corner balconies of the Rome and Florence are incredible! The photo shows the south wall where stucco is almost complete. 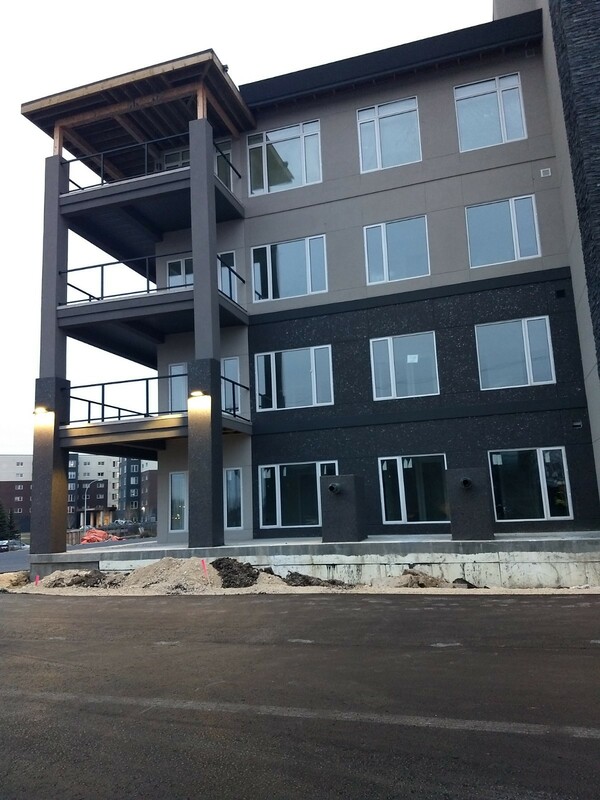 We have used a special kind of stucco which has never been used in Winnipeg before called Terraneo, that provides an elegance and class to the building. Sales also have been moving at a great clip as we have hit the 75% mark, but there are still 20 great units to choose from. Please visit for your last chance to pick your home. 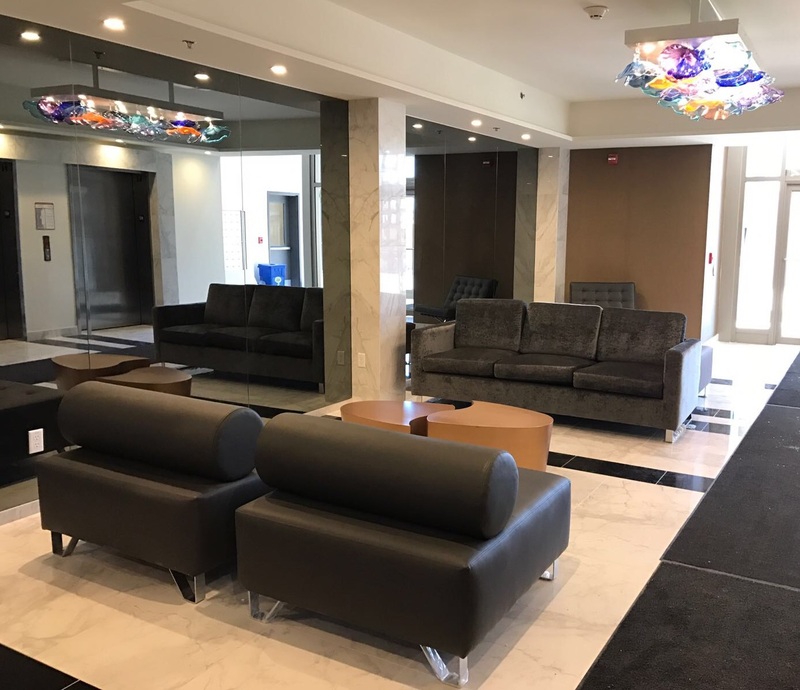 Our sales centre which is now moved across the road of the building to the Caboto Centre is open throughout the summer with extended hours at Folkorama. The Roof is Going On! 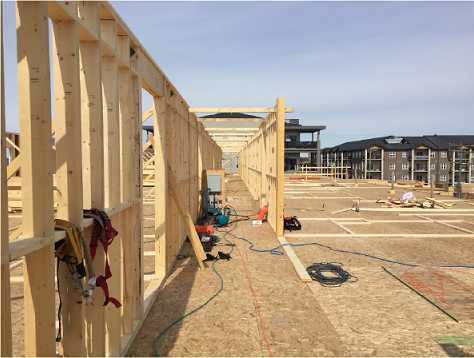 It has been a productive start to spring at Winnipeg’s Murano Gardens with the framing crew reaching the roof. 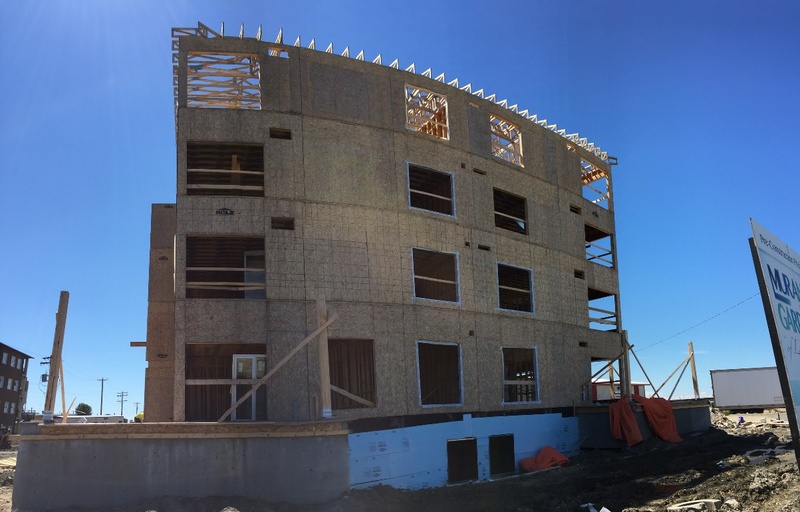 After delays due to high winds, the rafters have started to go up and will be followed by sheeting and the shingling of the roof. The triple pane energy efficient windows have also arrived on site and being installed in the first section. This will be followed by the install of the 8-foot patio doors for our oversized balconies. By the end of the month sections of the building will be ready to get stucco. This will get the building water tight allowing the trades to start dry walling and finishing of the units. A chat with Anupam Kothari of Murano Gardens. 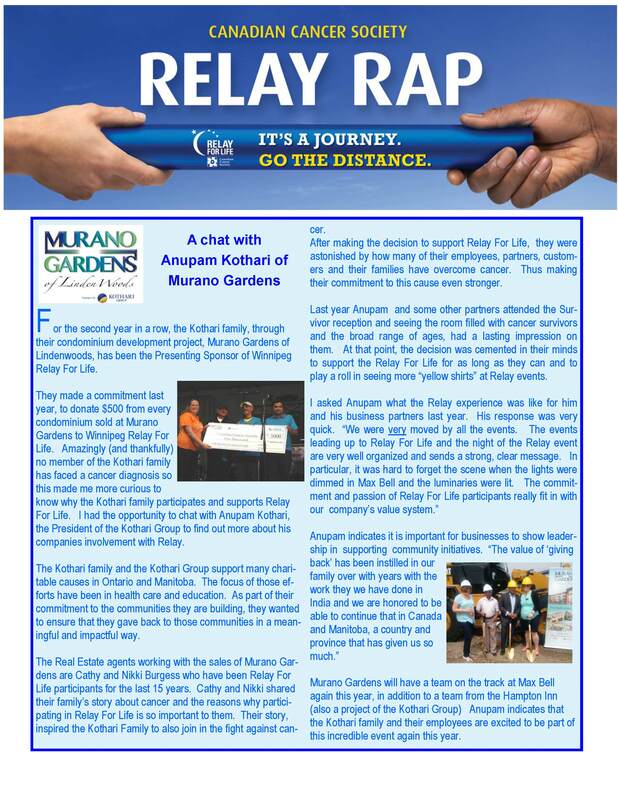 For the second year in a row, the Kothari family, through their condominium development project, Murano Gardens of Lindenwoods, has been the presenting sponsor of Winnipeg Relay for Life. 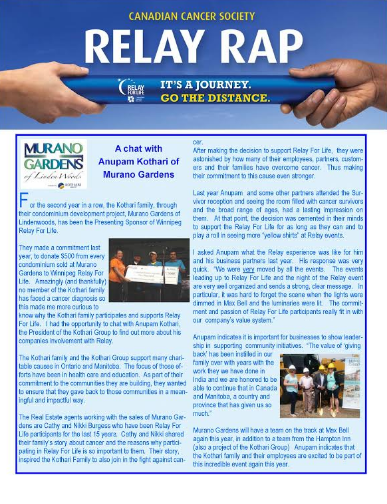 They made a commitment last year, to donate $500 from every condominium sold at Murano Gardents to Winnipeg Relay For Life. Amazingly (and thankfully) no member of the Kothari family has faced a cancer diagnosis so this made me more curious to know why the Kothari family participates and supports Relay for Life. I had the opportunity to chat with Anupam Kothari, the President of the Kothari Group to find out more about his companies involvement with the relay. The Kothari family and the Kothari Group support many charitable causes in Ontario and Manitoba. The focus of those efforts have been in health care and education. As part of their commitment to the communities they are building, they wanted to ensure that they gave back to those communities in a meaningful and impactful way. Welcome to the new year! 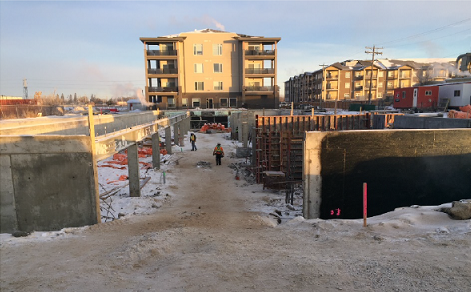 The hollow core main floor concrete slab is now fully up and the underground services in the parkade have commenced. We are most excited that the 1st floor walls and the 2nd floor have started to up now for Murano Gardens, your Modern Luxury Home. Sales have also reached 60% and our team has started working with clients to select their customizations. Purchasers that make their purchase decision before the end of March will be able to select their custom finishes. 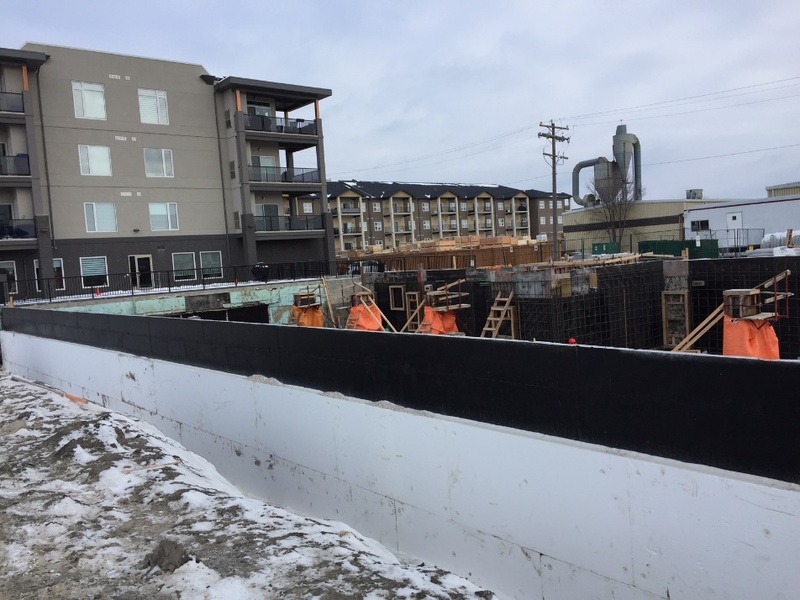 With winter around the corner, we are glad to report that the underground heating parkade walls are now fully up, and steel is being placed to support the main floor concrete slabs that are being delivered this week. The site servicing is also now completed. After the holidays, the wood will be delivered on site to start the framing for the main floor. From the entire project team at Murano Gardens, we want to wish you a very happy holidays and best wishes for the New Year. Great progress at Murano Gardens, considering the rain. Construction has been slow due to the rainy fall we have had. However, we have made some good progress at Murano Gardens. 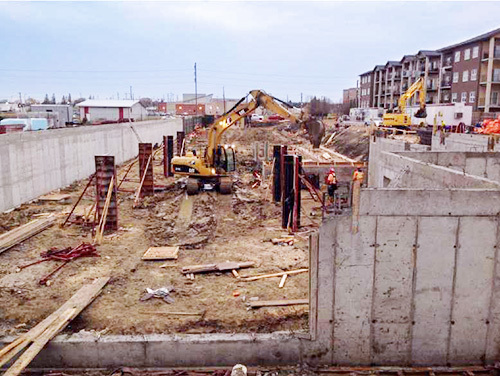 The piles have been all driven in and work is underway on the concrete walls of the heated underground parkade. Steel has been delivered on site for the beams that will sit on top of the walls and columns and will support the main floor hollow core concrete slab. In addition, the site servicing for water and sewer is more than 50% complete. Within the next few weeks the site servicing will be completed and the main floor slabs will start getting installed. We are pleased to announce that Murano Gardens of Linden Woods has started construction! The project will feature 80 luxury units with standard features including high grade kitchens, quartz countertops, stainless steel appliances and oversized balconies. The underground parkade structure has been excavated and piling has commenced. The expected completion date is fall of 2016. We also want to thank all of our buyers to date that have helped us reach 50% sales!